Our Riverside Plastics round saucers are fantastic for so many reasons. When you need a durable, long-lasting plant saucer that won't chip, crack, warp or fade, then you found them here. 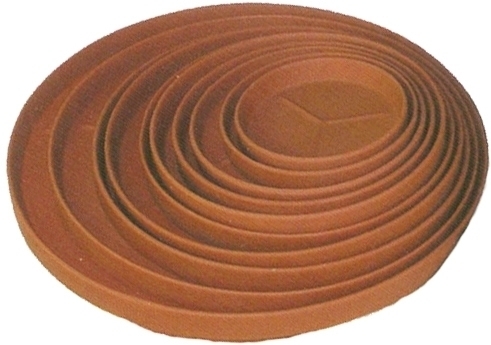 For larger garden planters that have a lot of weight, these pottery saucers work great because they can handle the weight of the potting soil along with the weight of the garden planter. Many times you can't find a larger glazed saucer in a certain color and that is where these pottery saucers shine. Available in 32 shades, these saucers are not only colorful but come in a huge size. This commercial grade, plastic saucers are the perfect solution when you want a lightweight product manufactured using high-quality materials, creative workmanship, all Made in America by Riverside Plastics. Most plastic saucers will fade, warp and crack over time. Our polyresin garden saucers will not fade, chip, crack, warp or break. Because of the slightly textured finish, once the saucers are placed under your garden pottery, no one will know that they are plastic. They are available in extra large sizes because they are molded and need no kiln firing like clay or glazed pot. Available in 32 colors means the possibilities are limitless. Preferred by landscape designers, decorators & architects. Perfect for inexpensive shipping fees!